Here is a quick guide for smooshing (feeling) the new 71011 CMF Series 15 packs. 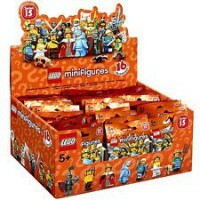 Smooshing is a term used by Lego fans for feeling the CMF packs' hidden contents to determine which minifigure is inside it. You should be able to identify each minifigure by feeling for the 1st accessory on the list below. The other accessories can be used for back-up identification purposes. i have not seen these on shelves yet, are they out and about in all markets? do we have the table of contents of a sealed case? I havne't seen them anywhere either went to TRU today and nothing. Also stopped by the local lego store but got a call right when I walked in so was only able to do a quick pass through the store and had to leave Might have missed them but didn't see any in my run through the store. I haven't had any luck finding fright knights using the smooshing technique. I got a few shark suit guys, but also a lot of wrestlers unfortunately. I'm kinda wary of standing in the Lego aisles too long, so I guessed a few figures incorrectly. Have any of you ever had store clerks asking what the hell you were doing? On the days I'm feeling exceptionally lazy, I just buy a ton of them, take them all home and smoosh them on the comfort of my own couch. Then, I keep all that I wanted and simply return those I didn't want to keep. That's what I like to hear, I am doing the same thing! I've done this before too but I admit that it's lame. Standing in the store feeling up bags to find the figures I want, I feel kind of like a pervert. People walking by stare at me and I just give them a smile as they walk by a little faster. Besides shark guy, any other minifig worth buying from this series? What are people's thoughts on the queen or the farmer? Did the same 2 mins ago. Walked out the store and then realized I got the lady trying to catch that animal thing (don't want this), feeling the bag more deeply when walking down the street. Entered again in the store and asked to change. She can dance, she can jive, she's having the time of her life.